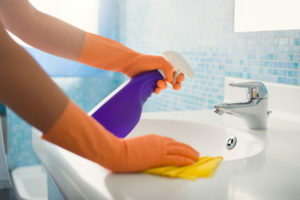 In our previous post, we gave you some simple but effective spring cleaning tips that will make this year’s spring cleaning something to look forward too. Here we continue our list to make your apartment living the freshest it has been yet! Both the inside and outside of your fridge needs to be cleaned. Take a vacuum to its condenser coil, which can be found in the back of the unit, to prevent overheating and malfunctioning of the unit. Then empty out your fridge (throw away all that expired food!) and give all the shelves a deep cleaning. Don’t forget to put a tiny cupful of baking soda in the back of the fridge, as it will help to neutralize any strong odors. No, we don’t mean a simple wipe down with a sudsy cloth. We are talking descaling, removing hard water, and getting rid of limescale. Even though you may be a part of the 36.9% of the American households who are renters meaning the hard water is out of your control, doesn’t mean you can’t stop it in its tracks! Drench some paper towels in white vinegar, and lay them over the faucet fixtures for at least an hour. This will make all the deposits easier to scrub away. It’s easier than you think; all you need to do is throw your curtains in your dryer on the air fluff cycle with a wet towel. This will help to eliminate dust and make your curtains look brand new. The same can go with your small throw rugs as well. Your comforters and blankets may not necessarily need a deep cleaning, but they sure can benefit being aired outside in the fresh air. The sun and the breeze can be pretty powerful, so hang everything outside for a cleaning straight from Mother Nature. With these tips in mind, cleaning your apartment amenities couldn’t be easier, and you won’t know what to do with yourself with all the time you saved! For everything from tips on apartment living to rental spaces and Reno apartments, contact Apartment Genie for your next home.